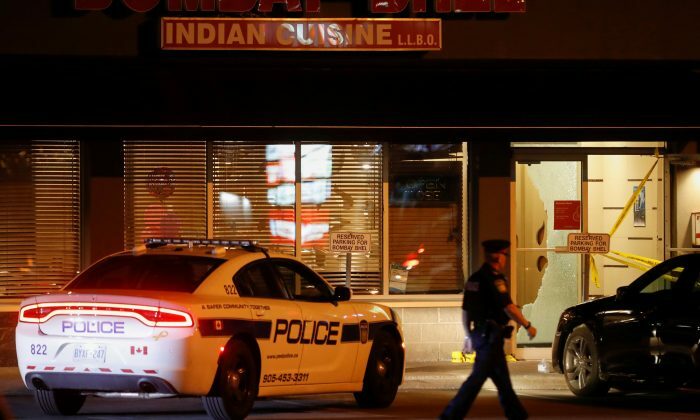 TORONTO—Two unidentified men walked into a restaurant on Thursday in the Canadian city of Mississauga and set off a bomb, wounding more than a dozen people, and then fleeing, local police said. The two male suspects fled after detonating their improvised explosive device, Peel Regional Police said in a Tweet. The men then fled the scene and are now being pursued by authorities. No one has claimed responsibility, and the motive for the attack was not known. Mississauga is Canada‘s sixth-largest city, with a population of 700,000 people, situated on Lake Ontario about 32 km (20 miles) west of Toronto. Bombay Bhel is an Indian restaurant chain in the metro area of Mississauga.